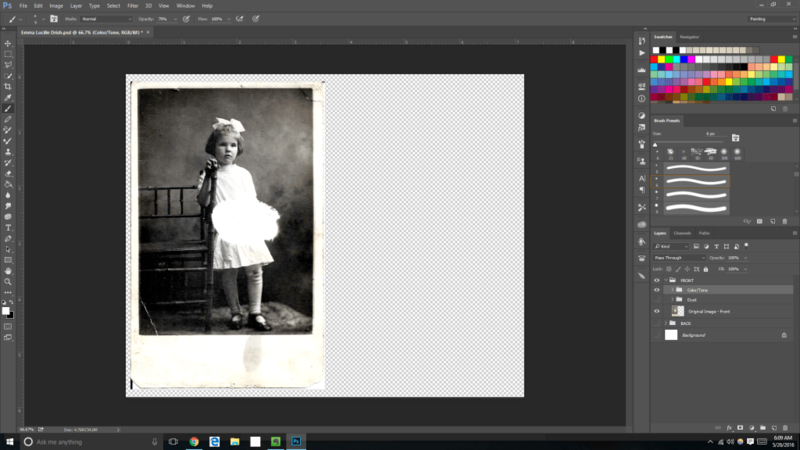 This is the second part of my restoration of a damaged photo postcard from my personal collection of little miss Emma Lucille Drish. 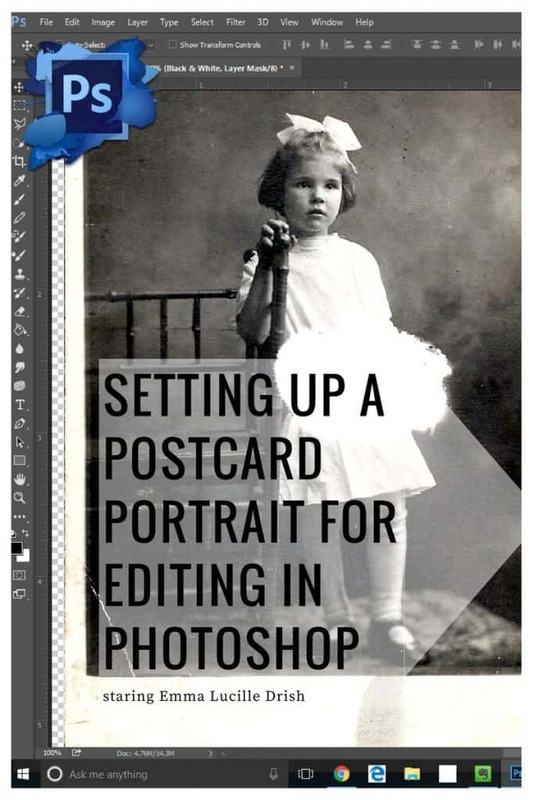 Follow along and you can do the same with one of your own photographs. Just in case you are jumping in for the first time now, let's revisit some prerequisites for following along with this series. I'd also advise you to take a look at part one, where we set up our file for editing. In this post, we will cover removing the tell-tale aging color cast, a quick and dirty way to remove dust, and scratch and tear repair. The image has yellowed due to age, and dirt from handling. The dirt around the edges has created a cast of its own. Time to remove the cast to take the image back to its true color -- black and white. We need to create a Channel Mixer adjustment layer. You can do this by going to Layer → New Adjustment Layer → Channel Mixer in the top menu. Rename this new layer to “Black & White”. Check the box beside Monochrome in the dialogue that pops up. You may have to play with the settings a little bit to get a good rendition of a black and white photograph for your own image, however as a general rule I start with 50% for both the red and green channels. That is what I settled on for this image as well. A view of the adjustment panel. Lower the opacity of the “Black & White” layer to 50% in order to get a more true to time period black and white coloring. The adjusted black and white image. 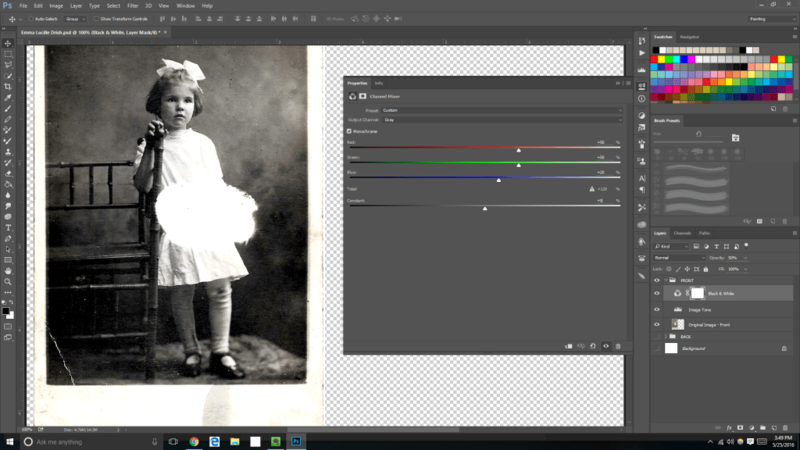 Create two new groups (or folders) in the layers palette. This time, name them “Color/Tone” and “Dust”. Make sure that the “Color/Tone” folder is on top of the “Dust” folder, and both folders are in the “FRONT” folder above the “Original Image - Front” layer. There is a ton of white and dark specks on this photograph, which equates to digital “dust”. There are a ton of ways to go about this! You could use the healing brushes or the patch tool, but for this image I took a more manual approach. 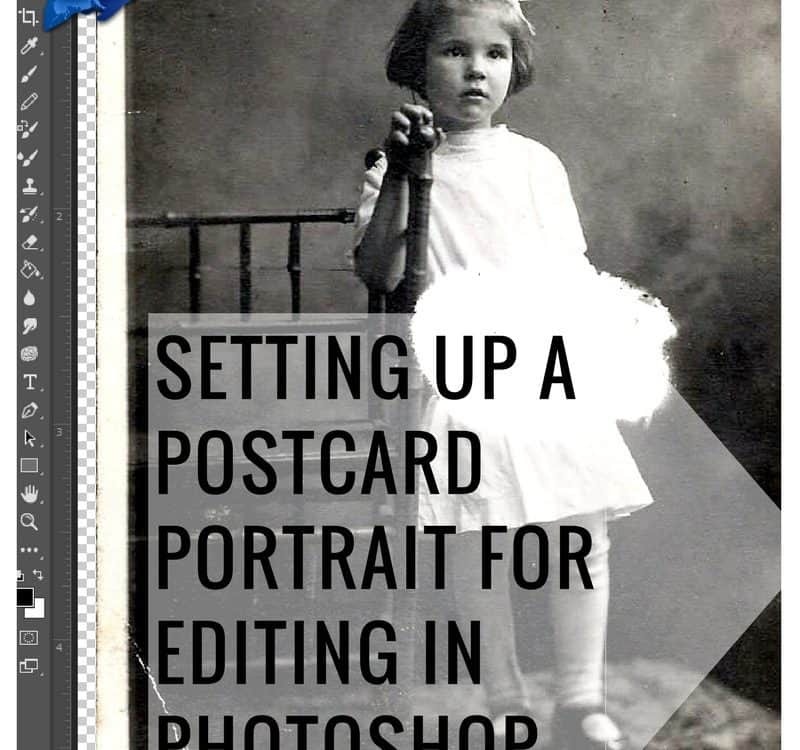 Duplicate the layer “Original Image - Front” twice by right clicking on the layer and selecting “Duplicate Layer…”. Name one of these layer copies “Lighter” and the other layer “Darker”. Move both layers into the “Dust” folder. Add a layer mask to each of these layers. With the "Lighter" layer selected, click the icon in the bottom of the layers palette that looks like a rectangle with a circle in the middle. This adds a layer mask to that layer -- you will see a white box pop up beside the layer image information in the layers palette. Do the same for the "Darker" layer. With the layer mask selected on one of the newly created layers, use the paintbucket tool to fill in the layer mask with pure black. Select a tiny round brush (as large as the small dust specks on the image, normally about 3 px) with hardness set to 0%. Make sure the foreground color (or the brush color) is set to white. 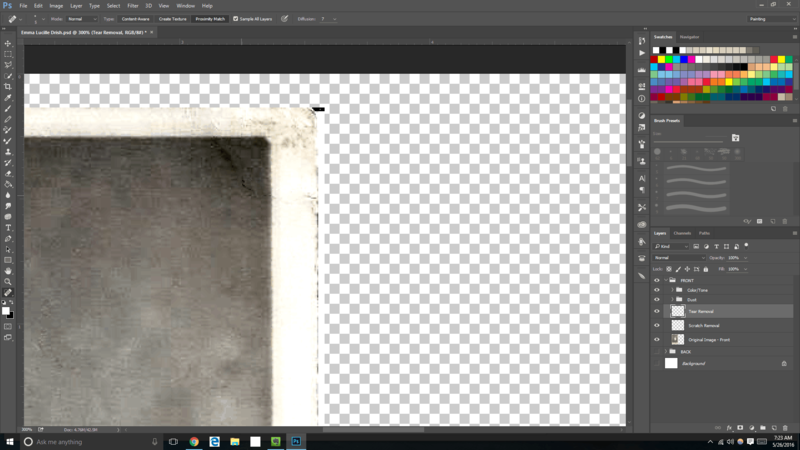 Turn the visibility of the “Darker” layer off by clicking the eye beside the layer. Select the “Lighter” layer. Change the blending mode for the “Lighter” layer to “Lighten” by selecting “Lighten” in the dropdown box at the top of the layer palette. We need to offset this layer two pixels down and right. Making sure the correct layer is selected (“Lighter” layer), click on the move tool, which is the cross of arrows in the tools menu. Tap the down arrow key twice, then tap the right arrow key twice. Select the layer mask of the “Lighter” layer. With the brush selected in step three, zoom in to the image until you can see the circle of the brush, the dust are close to the same size, and you can easily see the dark specks. Paint the white on the dark specks. Most of them should completely disappear! Turn the visibility of the “Darker” layer back on by once again clicking the eye. Set the blending mode of this layer to “Darken”. Follow step five for this layer also, in order to achieve a two pixel offset. Select the layer mask of the “Darker” layer. With the same small, soft, white brush selected, zoom back in to the image. This time, paint over the light specks of dust. These should disappear as well! NOTE: For those of you working on your own images at home, you’ll want to use the offset method on backgrounds and other things in the image that don’t need to be crisp. (such as faces). Don’t use this method on a face. You won’t like the results! In the lower left hand corner of our image, there is a white scratch. Thankfully, because it is in a less important part of the image, it will be easy to repair! Create a new layer, directly above the “Original Image - Front” layer and name it “Scratch Removal”. Select the “Spot Healing Brush Tool” which looks like a bandaid in the tools menu. Set the size of the brush to the size of the scratch (in this case, I used 4 px) with a hardness of 100%. Make sure that Sample All Layers is selected. I also selected Content-Aware. Using extremely short strokes of the brush, and in some cases just a click, brush over the scratch. This is something you will have to play with to get it right. If it doesn’t look right, just brush over it again until it does. 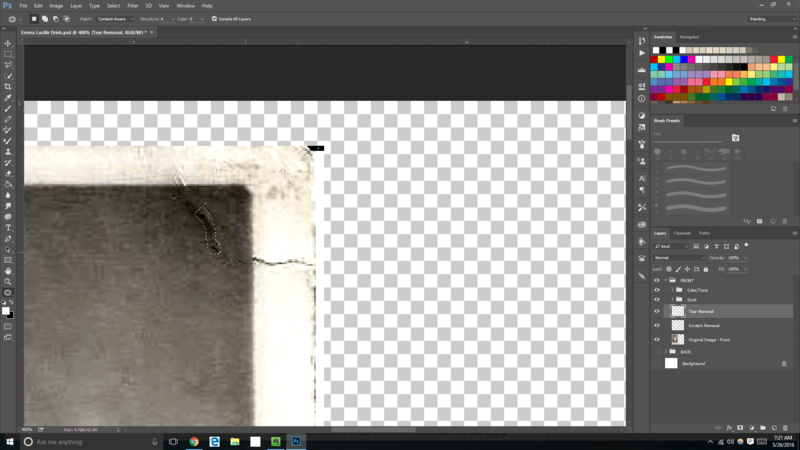 However, if it starts to soften the texture of the image, erase it and try again. Unfortunately, there’s no set way to tell you how to use this tool. You just have to experiment! Every photograph is different! In this image, there is a pin hole at the top where someone had pinned it to a bulletin board. You can use the same brush to slowly build that part of the image back up. 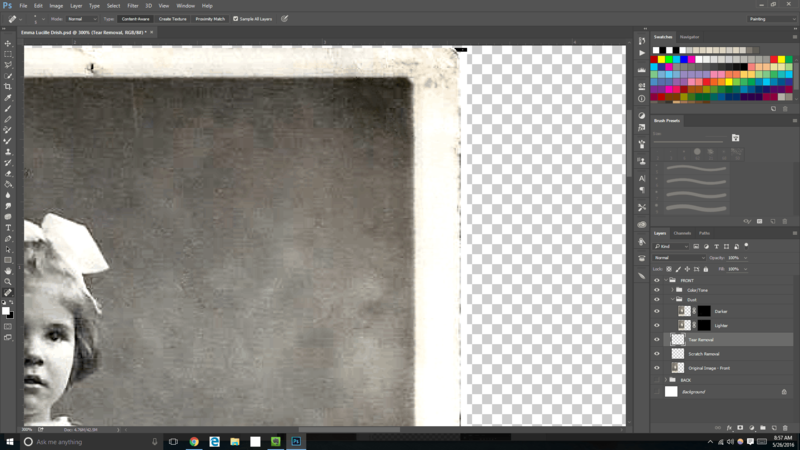 I also used this tool to clean up some of the dirt specks in the white space of the image. The tear in the upper right hand corner can’t quite be fixed correctly using the Spot Healing Brush Tool. Instead, we will take a look at the Patch Tool as a way to fix missing image information (such as in cracks and tears). Create a new layer above the “Scratch Removal” layer named “Tear Removal”. Make sure this new layer is selected. Select the “Patch Tool” in the tools menu. It’s easy to find because it literally looks like a patch. Go figure. Using the “Patch Tool”, click in the middle of the tear and drag to select a small portion of the tear; you should see those marching ants again! Note: Don’t try to select too much at a time. Do it piece by piece to get a better patch. Click and drag in the middle of the selection to replace that area with the image information from another part of the image. Experiment, dragging different ways until you get the best looking patch. Continue step three, working in small pieces all the way across the tear. Although we seemed to get a pretty good patch job out of the patch tool, you can tell that we did some retouching on the image. We don’t want that. We can blend that patch job with the “Spot Healing Brush Tool”. Go ahead and select it. This is how our corner looks after we have used the patch tool to remove the tear. With a small, soft brush, click quickly around the edges of the patch, slowly blending in the patched areas. This is how our corner looks after we have blended our patch job. Now that we have the tear repaired, let’s create a folder named “Physical” and put our “Tear Removal” and “Scratch Removal” layers in it to help us stay organized. Our image is really starting to look great now! We've removed our aging, dingy, yellow color cast. We've removed all of the dust that has been collected over the years. We were even able to repair a scratch and a tear. We still aren't finished, but it is starting to look so much better. Cant' wait to see you at the next step! Please leave your questions in the comments; I'm happy to help!